Dear readers of the "Iwata Asks" series, please allow me to introduce myself. My name is Nagata and I work for the "Hobo Nikkan Itoi Shinbun", a web page hosted by Shigesato Itoi1. I have had the pleasure of putting together and editing these articles. Up till now, I have been responsible for putting together the interviews chaired by Mr Iwata that you see on this web page. After one of these interview sessions, without any warning, Mr Iwata asked me if I would like to sit down and talk with him for a special edition interview. I found myself recording our conversation without any idea how this proposal would turn out. I present to you the result of that discussion here in "Turning the Tables: Asking Iwata", a special edition interview. This will be the only special feature in this series, so I ask that you please forgive us in advance for our indulgence. Next up will be the Wii software series (starting with Wii Sports). This interview is a little long, but please enjoy it as if it were an intermission of sorts to these interviews. 1Shigesato Itoi is a famous Japanese copywriter and game designer. 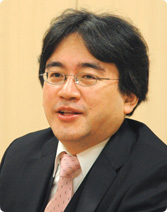 He is most well known for his work with Nintendo’s Mother series (known as EarthBound in the United States). Itoi voiced the father in the Japanese version of the My Neighbor Totoro anime film. So, why did you originally decide to undertake this particular project? As I wrote in my introduction, I felt that we should accurately document the course that led to the creation of Wii. With Wii, Nintendo has taken the idea of breaking with the past and made a console with the somewhat overblown code name "Revolution", all in the hope of dramatically changing the way things are done. This was definitely not an easy path, and we often worked without being able to see the light at the end of the tunnel. I felt very strongly that I wanted to document this process. Of course, for people that want to know what ideas were behind the creation of Wii, this kind of record might be valuable and interesting, but I didn't want to force it upon other people that might not be interested in hearing it. That's why we decided to put it on Nintendo's homepage, so it would always be available to everyone who wants to read about it. 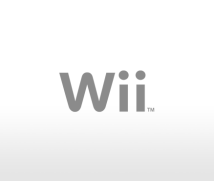 We thought that this would be the ideal format to inform people about the history of Wii and the ideas that went into its development. What made you decide to interview your own employees? Put simply, I thought that the current structure of Nintendo would enable me to do it. As the president, I am involved in all of the final decisions regarding every aspect of the Wii project. Therefore, in objectively telling our readers how Wii was created, I thought it would be the most expedient option for me to lead the discussions. Although there are not many precedents for this kind of undertaking, I thought it would be possible with Nintendo's current structure. The biggest hurdle to overcome was taking all of the important points from our conversations and turning them into understandable, readable articles. I would like to make this point clear, so please leave it in the final draft! (laughs) I normally write all of my own speeches, and I don't feel comfortable unless I've prepared all of the materials for a presentation myself. But for this series of interviews, there was no way I could find the time to put together the articles myself. However, it isn't possible for myself or the people I am interviewing to always speak in a way that is clear and easy for the readers to understand. So I realised that we would need someone with good writing and composition skills in order to get this project off the ground. Well, I've known you since the time you worked at a gaming magazine, and since we still keep in touch with your work at the "Hobo Nichi", the first person that came to mind was you, Nagata-san. Well, thanks for thinking of me! (laughs) I'm finding the whole experience fascinating. If you don't mind, I'd like to ask you a question. What's it like to be present at these interviews? Well, firstly, I'd say that I was surprised to find out that in addition to the details of the Wii project, you also know the personalities of all your employees very well. I think that might be a bit of an overstatement! (laughs) With over 1300 employees here at Nintendo, it wouldn't be possible to remember everyone! Well, at least with the people involved in these interviews, I can sense that you have a mutual understanding of each other's personalities. That might be because Nintendo deals with a relatively limited range of products. Also, since I myself come from a development background, I think I understand the minds of developers better than most executives. I also got that impression. In addition to that, we brainstormed with each other from square one. We were all running into the same walls, and we made the critical decisions together. I talked with a lot of people, such as Takeda-san and (Shigeru) Miyamoto-san, along the way at each juncture. In that sense, I think the fact that I have been centrally involved in the creation of Wii is the biggest factor in explaining why my staff and I understand each other so well. You used to make games by writing programs, and with Wii you have worked to create a piece of hardware. Comparing these two experiences, have you noticed any differences in your approach to the creative process? Well, of course, the sheer number and types of issues to be considered are vastly different, but my basic mindset didn't change that much from one to the other. Since I don't have the time to write programs myself anymore, of course I am not directly involved in that way, but I feel that I can clearly call myself one of the creators. When I am discussing things with the developers here, I am not just a bystander, and I discuss it as such. Once, during an interview with Shigesato Itoi for the "Hobo Nikkan Itoi Shinbun", you said that you never wanted to be a bystander. In that sense, the interesting thing - which is perhaps unprecedented - about these interviews is the fact that someone who has been involved in the project is interviewing other people who were also involved. That's a good point. One of the reasons I am doing it this way is because it's possible to discuss the project more deeply than would be possible if we called in an outside interviewer. Even though I know a lot about the development and was in fact involved in all of the major decisions, there are still a huge number of interesting stories I am hearing here for the first time from people that were more deeply involved in specific matters than myself. For example, stories about what was causing difficulties, what was the key to a certain problem, or what ideas led to a certain feature are extremely interesting to me. Those stories are really intriguing for me too, even though I am just sitting here listening to them. Well, you've been sitting pretty close to me, I think you can sense how much I've been enjoying these interviews, can't you? I really can. You already know about most aspects of the project at a surface level. If the project were a plant, then you would know about everything visible from the soil up to the top of the plant. Then you ask a question about one of the leaves or flowers, and as a result part of the root is revealed. You always seem so pleased when something unexpected is discovered like this. And it's not just you, either. All of the developers taking part in these interviews are also smiling. (laughs) They probably look so satisfied because they are in a place where age and rank don't matter, working with other people that share the same values in order to complete a major project. You know, normally when I interview game developers, it is after the product has already been completed and many of them are starting to have some regrets. Because it has already been released, right? Right. The more earnest a developer is regarding their work, the more likely they are to start feeling regrets, that they should have done something differently. Since I do so many interviews in that context, I hear a lot of the same comments and rarely get to see the satisfied looks I have seen here. With this project, I find it very interesting that I am able to hear you talk about the project just before its final completion, and all of you are so excited that you are just about to cross the finish line, so to speak. There is definitely that kind of excitement. But I think the reason that everyone has this content look is because the creation of Wii has been so completely different from the development of previous hardware. I see. Is that, for example, completely different compared to the development of the Nintendo GameCube? It goes without saying, but I don't mean to imply at all that there was no value in making the Nintendo GameCube or the other products that were made for it. But in the end, the Nintendo GameCube was built as an extension of its predecessors. With Wii on the other hand, I feel as if we have broken with tradition, taking a jump to a different dimension. I think we feel such excitement, as well as a sense of achievement, precisely because we have made this leap. Once Wii is actually released and we have a chance to see the reactions and criticisms of the consumers though, I am sure that everyone, myself included, will feel as if we should have done some things a little differently. Really, there is no such thing as a product that everyone is completely satisfied with. But with Wii, I have a feeling that the sense of accomplishment and satisfaction that has come with developing something so new and unusual will not dissipate even after its release. That's what the mood is like around here. Maybe this isn't the best way to say it, but when you challenge yourself to do something new and try to make that leap, it's a kind of gamble, isn't it? It is. When you try to do something that has never been done before, it goes without saying that there is no guarantee of success. It also becomes more difficult to defend your efforts by saying that you know they will result in at least a certain amount of success. For all you know, it might turn out to be a complete failure. That's true. But the people I have heard in these interviews don't seem to have any sense of gloom or pessimism. I think that's because they're already beyond that stage at this point. As was mentioned in previous interviews, everyone had their own misgivings at the beginning of development. I am sure that people were concerned about technical issues, the fact that they didn't know what they were working towards, and even their inability to understand the company's strategy. It's frightening to take a different path than everyone else. Even though it is an accepted part of life in modern society to find security in facing the future together, everyone has to do something different from everyone else. And even though it is a part of Nintendo's culture to praise people for doing something different, this time around the nature and scale of the difference was huge. In one sense, we were even going in the opposite direction. If that's the case, I suspect that the one most strongly affected by the fear of going in the opposite direction would be you, Iwata-san. How did you deal with that fear? Let's see… For me, I actually found that it would have been more frightening to take the conventional path. Of course, no one knows the most ideal time for change. When we decided to change the direction of the ship, so to speak, we didn't know how long it would take people to understand what we were trying to achieve. Would it be in one year? Or would it be two, three, or five years down the road? We knew that there was no future on the conventional path. That path would eventually lead to a battle of sheer brute force with our competitors, and fewer and fewer consumers would be able to keep up. So the only thing we were sure of at first was the fact that we wanted to point the company in a different direction. But we weren't sure how much change the consumers were willing to accept. In any case, we knew there was no future on the path straight ahead of us, and we realised that there would be no meaning to our efforts if we were just slowly plodding towards the end of that path. So we decided to do something about it. We were convinced that if the number of people playing games increased, there would definitely be a future ahead of us. I see. So, you changed the direction of the company even before the Nintendo DS became a smash hit. That's right. At that time, I wasn't so blissfully optimistic to think that the Nintendo DS would be so well received to the point that it would become a social phenomenon even in Europe and America. And the same is true now just before the launch of Wii. As the developers have mentioned several times in these interviews, we are anxious about how the world is going to react to something so unconventional. But at the same time, that's also the reason why we have this burning desire to tell the world about it. I see. Everyone else who has been a part of these interviews says something similar to what you have just said yourself. I think it's pretty incredible that everyone here shares the same values, that there is such consistency in the mindset of the organisation as a whole. It is remarkable, isn't it? I think we've made a lot of progress in this area over the last three years. So, specifically, how did it come to be this way? Well, I would have to say that it's the result of a lot of small steps forward over time. Just because on one occasion the president tells everyone what he wants to do doesn’t mean that everyone accepts it immediately. That's why after being told about the vision for Wii time and time again, a few people at a time were able to understand what I was getting at and began to support the idea once parts of it started to become a reality. The idea that certain things must be done in order to accommodate this vision eventually spread to everyone in the company. This is what led to everyone sharing the same vision of the near future. So I suppose it was the result of continually repeating the same mantra. Well, I think you would have had a hard time achieving these results by just repeating your message. Do you think it was facilitated by the fact that you had some clear results to accompany what you were saying? Well, there was also an element of luck in producing those results. Taking the right path doesn't necessarily guarantee good results. It's just like trying to second guess what people will find enjoyable. It's even more true when releasing a new product: whether it's going to be a hit or not lies beyond our control to a large extent. That's true. Take Brain Training, for example. Before it was released, you could have said that it was fun, but no-one could have predicted that it would sell 6 million copies! "It's a lot of fun!" can quickly become: "Well, it's a lot of fun, but..."! (laughs) In truth, it's not like everyone at Nintendo who saw Brain Training said "This will be a hit!" What I'm trying to say is, we might be able to raise our batting average through our own efforts, but we can never guarantee we'll get a hit 100% of the time. That's true. To sidetrack a little, with relation to "hitting it", the example that Mr. Shigesato Itoi often uses is that of Tsurube Shofukutei2. When you wonder why such funny things always seem to happen to him, it's not because his "batting average" is high. Rather, it's got to do with the fact that he steps up to the plate more often than other people, so to speak. What I mean is that Tsurube-san is the kind of guy who if someone is handing out free samples or flyers in the street, he'll always stop to take one. When people say hello to him, he'll generally stop to have a chat. 2Tsurube Shofukutei is a famous Japanese comedian, most well-known as a teller of comic stories in the rakugo tradition. So, rather than sitting around thinking about their batting averages, it's the people who just keep going up to the plate who have more chances to get a hit. It's pretty obvious advice, but it isn't that easy to keep putting yourself out there. However, if you have something to aim at, I think the persistence with which you work towards your goal becomes more important. If you have a goal, but it doesn't go well at the first attempt and you never step up to the plate again, well, nothing's ever going to happen. For instance, if (Shigeru) Miyamoto-san had given up on the concept of putting the player inside the game on Mario Artist: Talent Studio3, there would never have been a Mii Channel. 3Mario Artist: Talent Studio is an animation production studio which lets the user insert captured images such as human faces onto 3D models and then animate the models. It was released exclusively in Japan in February of 2000 as part of a bundle with the Nintendo 64 Capture Cartridge. Absolutely. Without Miyamoto-san's persistence, it would never have happened. To be honest, I don't think Talent Studio was a perfect piece of software when we released it. This is something that I think will come up in the interview about Wii Sports, but we had some software called "Manebito Camera" (there were plans to put this out as Stage Debut, but it was never released). Here he also doggedly tried to pursue the same goal. In spite of the fact that this was never fully realised either, Miyamoto-san still wanted to implement the kokeshi4 idea when we worked on Wii. If we hadn't had his persistence - dare I say, obsession - then, when I laid eyes on the prototype software for the DS which became the model for the Mii Channel, I never would have thought: "Wait a minute! This is what Miyamoto is after!" I would never have shown it to him. 4Kokeshi are traditional wooden Japanese dolls. They are cylindrically-shaped, with no arms or legs. Without that, perhaps Wii would have turned out very differently. Wii would most certainly not be the same console we have today. It wouldn't have the Mii Channel, and Wii Sports would be very different as well. Then all those fans around the world wouldn't have been grinning from ear to ear when you and the others were playing tennis at the E3 presentation. Right. This is something that I've said throughout these interviews, but in developing Wii, we didn't work to a fixed plan. Rather, we had to improvise a lot, and the finished product is the result of a lot of groping in the dark for what was a workable solution at a given time. I think the reason we arrived at where we are now is that, even when there was uncertainty, we never wavered from pursuing the clear goal we had in mind. May I ask a rather blunt question? Imagine you were, plainly speaking, far and away the market leader, as you were at the peak of the Super Nintendo's success, and let's say that you felt "there is no future down this path." Would you still have been able to steer the ship as you are doing now? Well, let me see...To be sure, the way the ship is steered was not the same when we had the biggest market share as it is now. But although the way you steer may change, as market leader, you have to go forward with a sense of urgency. Time passes very quickly, and if you are complacent, you'll be too late. If you feel that the course you are on has no future, then you have to change your direction even if you're the market leader and everyone is telling you "You're at the top, so there's no need to change. Just keep going along as you are." But the way you would go about it does change depending on whether you're market leader or not. I understand. I apologise for asking such a difficult hypothetical question! Not at all! (laughs) I've also got a question for you. As a game fan who has observed Nintendo over the years, how do you feel about the recent developments? Well, I'm very excited. What more can I say? But a statement like that isn't much good to anyone! (laughs) Hmmm...I think there are game fans out there who are a little concerned. Do you think they are worried that in the future we won't give priority to making the kind of games they have come to expect? Although we're putting a huge amount of energy into Mario and Zelda, since those games don't feature that much at the Wii Preview events, they don't seem to be the main pillar of Nintendo's strategy. Is that what people are saying? It does seem that there is a level of misunderstanding among some people. I am concerned about this. It's true that Nintendo is reaching out to non-gamers, but this does not mean that we are ignoring game fans. I believe that if we don't make moves to get people who don't play games to understand them, then the position of video games in society will never improve. Society's image of games will remain largely negative, including that stuff about playing games all the time badly damaging you or rotting your brain or whatever. If that happens, then even people who enjoy games will start to feel a strange guilt when they play them. If people who haven't played games up til now start playing them, and appreciate how enjoyable they are, it is highly likely this situation will change. Society will be more accommodating towards people who play games, and it will become even easier to produce "traditional" games. In reality, while Nintendo is looking to reach out to people who don't play games, it's not as if we've become less committed to Zelda. On the contrary, we've invested four years and a huge amount of effort into developing the new Zelda. There's no question that we are passionate about it. For the people who are willing to wait for them we will absolutely continue to produce games like that. But I think if we don't also develop things for non-gamers, the future for game fans will become bleak. But having said that, we don't develop games with two categories in our mind: "This one's just for people who don't play games..." or "This one's just for gamers..." Take Wii Sports, for instance. I think gamers will enjoy the Target Practice mode more than anyone else. Even with something like Brain Training, which generally isn't seen as being a game, lots of users recognised that there was the same excitement in trying to beat the clock, as there is in a racing game, to put it in very basic terms. Ah, yes. It's the same feeling of enjoyment. On the calculation problems, searching for numbers on the edge of your field of vision...that thrill when your hand movements have become almost robotic...it's very much like that of a puzzle game. It's exactly the same. I think the place in your brain where this feeling comes from is the same in both cases. That's why, even in Touch! Generations software, the core elements have all the original fun of a game. You've simply expanded the scope of what a game can be. That is to say, ever since the DS came out, everything you have done has ultimately boiled down to broadening the dynamic range of video games. You are not trying to replace, or reject, the games that have come before. Well, everyone is busy...! (laughs) People have a certain amount of potential within them. Ensuring that this potential is used as productively as possible greatly helps an organisation. To put it another way, there is a vast amount of energy which disappears inside organisations, or is expended going in directions which don't end up leading anywhere. If all that energy is properly directed, it can add up to a huge amount of power that can be used to produce visible results. That's why I think that over the last three years, as the level of awareness shared by the staff has increased, each individual's understanding has also developed. I believe this has meant that the total amount of energy in the company has increased more than it would have by simply increasing the number of staff. That is to say, the overall potential within the company has become more fully realised. The fact that the number of developers who can sit here and give clear and precise opinions has increased may well be proof of that. In fact, one of the motivations behind doing these interviews was my desire to push these developers more to the forefront. Yes, I got that impression. To be more precise, I thought it would be good if there was an opportunity for people besides Miyamoto-san to speak about their work in detail. Needless to say, Miyamoto-san remains Nintendo's linchpin, and it is essential that he continues to work at the very heart of our production. But it is precisely because there are others beside Miyamoto-san that we are able to put out such a large number of products. While it's impossible to get everyone involved to speak about their work, by making the public even just a little more aware of the existence of such people, I hope to help Nintendo look like an interesting, diverse group of people. But one thing I found really interesting sitting in on these interviews, was that even when Miyamoto-san wasn't present, his name would always come up. It's an interesting phenomenon. Also, whenever the conversation turns to Miyamoto-san, you always seem somewhat happy. Well that's because, as you can imagine, I have learned a vast amount about making video games from Miyamoto-san. It might be better to say that I didn't learn from him, but rather stole from him! From the early days of working at HAL Laboratory5, I was always watching and learning from him. From outside of Nintendo I used to observe him, my eyes like saucers, wondering: "Why does Miyamoto-san always succeed?" Now, by a curious twist of fate, we've ended up in these relative positions to each other...it really is funny how things turn out! (laughs) 5HAL Laboratory, Inc. is a Japanese video game developer. The company’s most famous character is probably Kirby, but it is also well known for the Super Smash Bros. series. 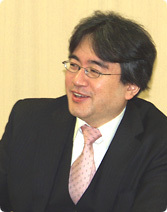 Mr Iwata began working as a games programmer there. I get the impression that your experiences outside Nintendo are really useful to you now, making decisions as Nintendo's president. I would say that, of the things I have experienced up to now, there is very little that has not proved to be useful. Well, I don't know all of the details, but I think that in your old job there were a lot of cases where you turned dead-end situations around and found a way forward. The rebuilding of HAL Laboratory is one example, Mother 26 is another... 6MOTHER 2, developed by HAL Laboratory, was a game released for the Super Nintendo as Earthbound in the US in 1995. Yes, there are a lot of experiences that still carry a lot of relevance for me. The decision to temporarily call off Mother 37 is one of them, as is the process which gave birth to Kirby and made him into a star. Another is when Smash Brothers was released, after a lot of twists and turns, and was well-received worldwide. There are a lot of examples. 7MOTHER 3 was originally scheduled for release in 1996 on the Nintendo 64. However, this was cancelled in 2000, before being released this year in Japan for the Game Boy Advance. Do you have any experiences of being unsuccessful, as opposed to something simply not being quite as successful as you had envisioned? But Mother 3 was finished, eventually. Well, in the end, I suppose so. Ultimately, I think you could say it was a success. "You have to stop being a bystander, and just step up to the plate!" (laughs) Well, we've spoken at length, so to recap, Wii was a product where we were not able to see how things would end up from the start. The only thing that was clear was the fact that there were no answers along the path we were on, so we decided to change our direction. Of course, time is limited, and we have to keep releasing products, just as we always have. Looking back on what we have done - releasing a new portable console while preparing for the release of this new hardware - during that process, there are plenty of small things about which I could say: "If only we'd done it like that!" But, strangely enough, there is nothing about the completed Wii about which I could say: "We should have done that differently!" I can say with absolute conviction that, even if we turned the clock back, we would end up making the same console. I think that's why everyone has looked so content during these interviews. And that just about wraps it up. Ummm...in the end, it certainly didn't turn out to be another "Iwata Asks" feature, even though I had planned for this to be a special edition where I asked you all the questions. No! This is a special interview. I'm sure the readers will be more satisfied with the "Asking Iwata" style of this feature.